The Beats Studio 3 Wireless might not suit the audiophile, but for everyone else, they're very easy to recommend. Especially iPhone users. In 2016 Beats upgraded two of its most popular headphones - the Powerbeats and Solo - and released the all new Beats X. All three came equipped with the same W1 chip that makes the Apple AirPods so convenient to pair for iPhone users. For 2017 it's time for the Studio to be given the same treatment. 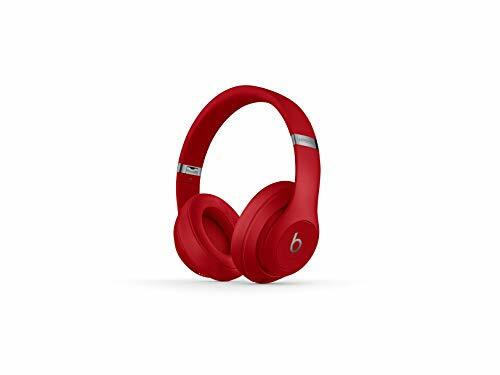 The Studio 3 Wireless is the latest flagship product from Beats, which also comes equipped with the same W1 processor. While it looks similar to the last model, everything inside has changed for the better. Is the Studio Wireless 3 the over-ear headphones product to beat all others? On the surface, the new Studio 3 Wireless look very similar, indeed almost identical, to the previous Studio Wireless. It has the same plastic headband with hinges built-in allowing you to fold both the earcups inward for stowage. As over-ears should, the earcups are designed to fully surround the wearer's ears with the improved padding covered with a soft, leather-like material. Combined with the soft, flexible padding on the underside of the headband it makes for a very comfortable pair of headphones. We were able to have the Studio Wireless 3 on our head for a solid two to three hours and still felt no discomfort. The ear padding is supremely comfortable, with the only downside being that once you take them off, you realise your ears have been sweating while inside these sumptuous ear-duvets. Like the last generation, there's a chrome-finished panel above each of the hinges, although there is a lack of glossy finishes in the colour options. Each of the six colours is a matte, with the only shine provided by those aforementioned chromed panels, and the the iconic "b" logo on the exterior of the earcups. There's a set of physical controls on the outside of the left earcup that allow you to skip tracks, adjust the volume, take calls or launch Siri on your iPhone. The middle "b" icon on the left side acts as the play/pause button, while the upper part of the surrounding ring is the volume up button, and the lower part is volume down. The power button on the underside of the right earcup doubles-up as the Pure ANC activation key (that's active noise-cancellation, if you're unfamiliar with the acronym). Press-and-hold it for a second and it'll turn the headphones on or off. Double-press it quickly to activate or deactivate the built-in noise-cancellation. Overall, the Studio 3 Wireless are incredibly comfortable to wear. And despite being plastic they don't give that "cheap" feeling of some previous versions of Beats headphones. The addition of new matte colours, particularly the Shadow Grey version we reviewed, ensures that they remain stylish and subtle, not ostentatious or overly shiny. Most active noise-cancelling is based on playing a quiet preset single noise to cancel out ambient noise. In a good pair of earphones, this can work well, but it's not very flexible. You'll find that it doesn't cut out higher frequency noises, or perhaps even some incredibly low ones. Beats has gone a different route with its Pure ANC technology in the Studio Wireless 3. Rather than just play a preset frequency, it continuously detects the noise around you and adjusts the noise-cancelling and music playback to match your environment. Whether that be on a plane, or in a busy bar or cafe. It goes through this process up to 50,000 times per second. In use, we found the noise-cancelling worked really well, being able to negate most unwanted noise from our surrounding environment. These headphones are particularly good at dealing with the lower frequencies, such as the boom of male voices, for example. Equally, muting the interior hiss of a plane is no issue either. It doesn't seal you off in a noise-less bubble however. If you listen carefully enough, you can still hear loud, high impact or high pitched noises. Clapping and doors closing, for instance, are still audible with the Pure ANC switched on. Another issue with other company's ANC is, at times, wind noise. Because ANC typically uses microphones on the outside of the earcups, wind can often blow across them making a horrendous "tearing" noise in your ears. Beats' new Pure ANC engine can tell when this is happening, and cut this out too. As a test: after four to five seconds of air blowing directly at our ears from a nearby fan, the earphones understood they were encountering wind tear, and just cut out that rustling noise. It wasn't perfect, but it dealt with the majority of the unwanted noise. The real take-away is that you can tell when the noise-cancelling is switched on, and when it isn't. What's more, the ability to switch it on or off just by double-pressing the power button is a nice touch, helping to extend battery life rather than leaving it on at all times. We've seen the convenience of the W1 chip in the Apple AirPods before - which allows fuss-free pairing across your Apple devices - so it's great to see it here in the Studio 3 Wireless. Beats X: What makes Apple's W1-enabled headphones different? The W1 chip allows you to pair the headphones with your iPhone just by bringing the two devices close to each other and clicking "connect" on the pairing pop-up that appears on screen. When you're signed into the same iCloud Drive account on your iPad and/or Mac, the headphones are then automatically paired with those devices as well. Just whip out your MacBook, power on the Studio 3 Wireless, and you can play music immediately. In real-world testing, this is one of those Apple-flavoured features that just works. And works so well. While it's not technically magic, it certainly feels like it, given our years of experience with other Bluetooth devices that require re-pairing. However, there is one downside to this W1 technology. If you have an Apple Watch, it automatically connects to your watch at the same time as your phone, so any notifications make an audible ping in your ears. Which is potentially useful, except in our testing it paused the music every time, meaning we had to hit the play button again, manually. If it wasn't for the conveniently placed play/pause button on the earphone, this could have been seriously detrimental to our experience. Most importantly of all, the W1 Chip makes battery performance way more efficient. The Studio 3 is a perfect example of this. With its Pure ANC switched on, the headphones can stream music wirelessly, non-stop for up to 22 hours. That's 10 hours more than the previous model, despite having virtually the same battery capacity. With Pure ANC switched off, Beats promises up to an insane 40 hours. Surprisingly, we think Beats' estimates are conservative. When we sat down to actually track the battery percentage - which you can do thanks to the W1 Chip - after three hours of constant listening via Spotify, the battery dropped from 96 per cent to 85 per cent. At that rate (~3.7 per cent, per hour), it would still have somewhere near 20 per cent left at the claimed 22-hour mark. It's worth noting that this was in a relatively quiet environment and so the headphones didn't have a lot of exterior/ambient noise to contend with. Either way, the Beats Studio 3 Wireless can last a very long time between charges, even if you have the noise-cancelling switched on. What's more, with Fast Fuel charging technology onboard, you'll be able to plug your new Beats in for just 10 minutes and get up to three hours of playback. Beats are known for bass, but we really enjoy the sound profile of the new Beats Studio. Sure, bass is prominent, but it doesn't muddy the mid or high-end frequencies. But make no mistake, there's still plenty of the low-end stuff. The Studio 3 Wireless retain detail, so whatever genre of music you like we think you'll enjoy the Beats earphones. They're incredibly versatile. It's impossible to listen to you favourite music and not be immersed and swept away in it. In the songs that allow it, you can hear subtleties like strings pressing against the metal frets during chord changes in acoustic sounds. As an example, listening to some of Newton Faulkner's more recent music with droning bass and some clappy, clacky percussion is the perfect canvas for these Beats. It's just so damned enjoyable, even if it's not what a studio would class as perfect or balanced sound. The Beats Studio 3 Wireless is one of those great pairs of headphones that help you once more appreciate songs you've almost forgotten about. By bringing details to the fore, helping you hear details you didn't notice before and filling in the background with warmness. The Beats Studio 3 Wireless might not suit the audiophile, but for everyone else these over-ear cans are very easy to recommend. Especially for iPhone users, thanks to the W1 chip's easy pairing and cross-device ease of use. Even if you're not an iPhone user, the ultra-long battery life, attractive and comfortable design, and serious sound quality makes these Beats stand out beyond their over-ear competition. Sony's on-ears from last year wowed us. They're a five-star product with excellent noise cancelling qualities and brilliant sound. A year later, they might have a follow-up, but they're still very easy to recommend. Undoubtedly one of Sony's best pairs in a long time. When it comes to noise cancelling, the Bose QC35 have the reputation for being the market leaders. With Bose you also get the company's signature sound, which is thoroughly enjoyable. One of our favourite pairs of earphones this year, might not have active noise cancelling, but it still has a lot going for it. The build quality and materials are superb, and the sound is fantastic.